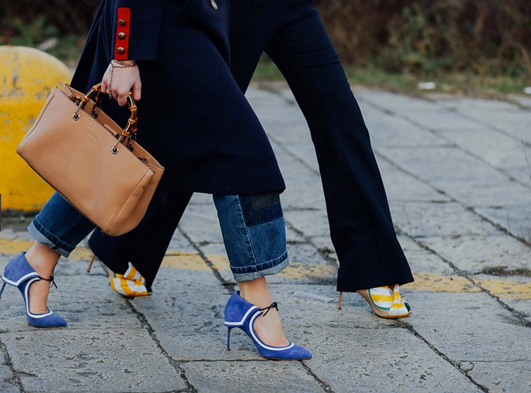 Predictably, spring's shoes will have us baring some skin, but this year, we'll also be busting out unexpected colors and prints. For this trend, we can thank a far-reaching range of designers: Aquazurra and Valentino focused on striking Southwestern-inspired patterns, while Tabitha Simmons and Sophia Webster adhered to colorful embroidery and embellishment. Gianvito Rossi and Lanvin featured bold color-blocking, as Paul Andrew, Fendi and Dolce & Gabbana spotlighted florals. Even Nine West is in on this trend, stylishly mixing and matching prints. Then there are those who cranked up the color spectrum, like Chloe, Zara and Tibi. I'd like to slip into these season statement makers from Isabel Marant (or these! ), Sam Edelman, J. Crew, Elina Linardaki, Madewell and Proenza Schouler. They are ALL so exciting!! I can't make up my mind! Perfect post for shoe lovers! Thank you! who makes the blue shoes in the pic above?